The star EV Lacertae also known as EV Lac, Gliese 873 or HIP 112460, is a red dwarf star with spectral class M3.5 in a distance of about 16.5 light years. This star with an age of about 300 million years is a relative young one and is known also as a flare star. Because of the young age the star is still rotating very fast. This leads to very strong and twisted magnetic fields which can unleash extremly powerful flares. During such a flare strong X-rays and gamma rays are emitted. On April 25, 2008 the NASA satellite Swift recorded the most powerful flare ever seen from a star other than the Sun. This flare on EV Lac was thousands of times more powerful than the largest flare observed on our Sun. Until this time such powerful flare events were known only from neutron stars but not from normal stars. Because of the emitted short wavelengths the observable change of brightness caused by a flare depends on the used filter system. While a record in the V-band would not show much brightness change the recordable amplitude in the B-band is already useful and would be best in the U-band. But with amateur equipment the U-band is difficult to record because the common CCD sensors are not sensitive enough in this wavelength range. So a B-filter would be a good compromise between sensitivity and useful resolution in time. For my recordings in northern Austria in Nonndorf at 15 14 08.2 E, 48 47 13.6 N, 547m MSL (MPC C47) I used a B-filter from Astronomik Profi Typ 2c RGB-Filter set. In this way I got a good SNR in recordings with an integration time of five seconds. The photometric evaluation of the CCD images was done with the MPO software Canopus Version 10 from Brian D. Warner. 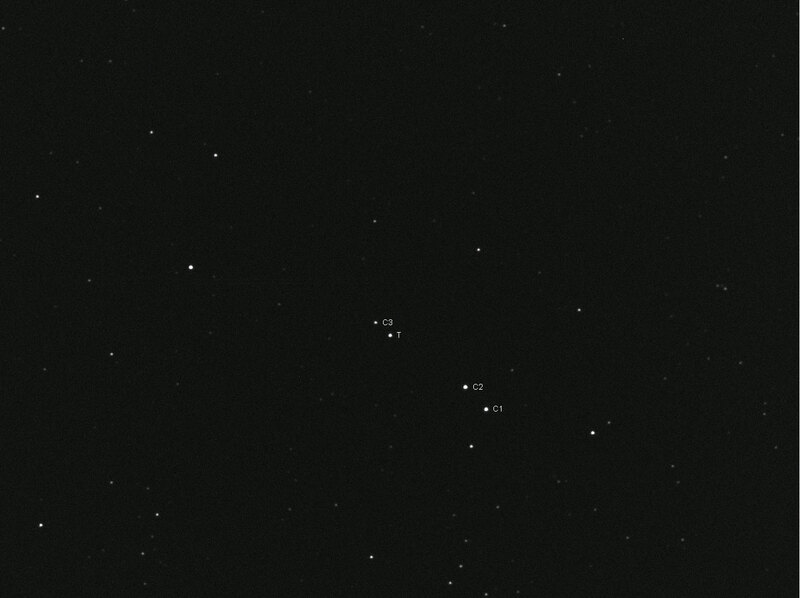 Therefore first all images were corrected with additional captured dark field and flat field images. The master dark field image was used from a dark image library exposured some time ago. Flat field images for master flat field image were exposured immediately after the end of EV Lac imaging using a special EL light foil 297x420mm. Several flare events of EV Lac could be recorded in this observation nights until now.